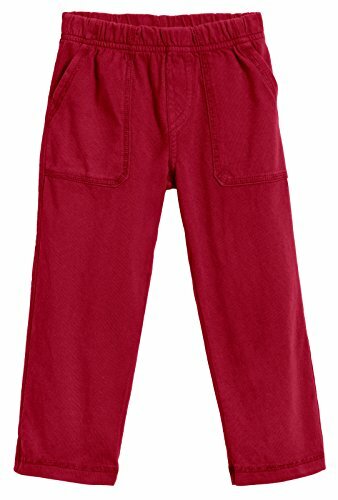 Soft and comfortable cotton jersey pant that kids love! 2 front pockets, 1 back pocket, and a full elastic waist. So comfortable that your child will feel like they are wearing pajamas. Breathable, colorful and comfortable. Top-quality, locally-knitted, American-made fabric washes well and is long-lasting. Great for playdates, school, birthday parties or just lounging around! Why pay a little more for these pants? Simple, because these are QUALITY items made with the highest-quality materials, highest-quality stitching, safe, comfortable, and made in the USA. Trust us, your child will LOVE them and we they will ask to wear them over and over again. They are perfect for sensitive skins because they contain no harsh chemicals and are made with super-soft cotton. There is no substitute for giving your kids comfortable, safe, and good-quality clothes. It may even save you money because these items will last long and be worn a lot!